‘Tis the season to cook and bake with pears! This time, instead of the usual poaching pears in wine/port/sherry or any other red colored liquid, we’re going to be poaching them in another quintessential winter drink: hot chocolate! Thanks to the inventiveness of Colby Garrelts and Megan Garrelts, authors and chefs of the Bluestem cookbook, these pears have come to live in my kitchen for the past 2 days and we’ve had one for dinner for the past two nights. N8tion.com is a web television and radio network covering a wide variety of topics from music to entertainment. Produced out of our Atlanta studio, our web shows feature guest experts, music artist, business founders,music producers, movie stars, comedians, technologists and CEO’s — all keeping you up to speed on what’s happening with a fast and funny style. Informative and entertaining, N8tion.com is the place for whatever your interests may be. The company was founded in 2010 by Myron McDaniel and Otis McDaniel and is based in Atlanta, GA. These pears are decadent, without being overwhelming. You can use your favorite chocolate to poach them in, as well as adapt the spices. We added a few cardamom pods to enhance the holiday flavors even more. Make these the night ahead of a dinner party and re-warm just before serving. This is a comforting and lovely alternative to wine-poached pears. 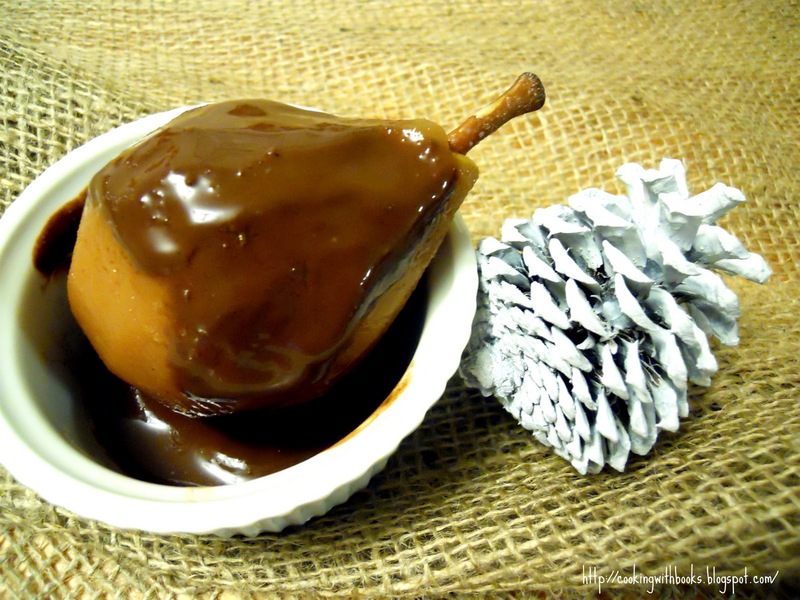 Letting the cooked pears steep in the chocolate poaching liquid overnight helps intensify the chocolate flavor. These pears are best served warm. This recipe can be doubled. In a large saucepan, bring the water, sugar, cinnamon sticks, allspice, and cloves to a simmer over medium-high heat to dissolve the sugar. Add the chocolates, cocoa powder, rum, and salt and whisk until the chocolate is melted and smooth. Add the pears and poach them for 45 minutes over low heat. Turn them over once halfway through the cooking process so they cook more evenly. They should be tender enough that a knife inserted in the thickest part will easily slip in and out. Keep the pears warm until ready to serve. If you’re not using them right away, you may refrigerate the pears in their poaching liquid in an airtight container for up to 2 days. To reheat, warm the pears in their poaching liquid in a saucepan over medium-low heat and drizzle the sauce over it before serving. Check out the video TheN8tion has developed specially for Virtual Potluck! What’s your favorite way to cook and bake with pears? Do you have a favorite pear variety? Hot chocolate poached first time I’ve seen that. I bet kids and adults alike will like it! Is it poor etiquette to pick up the pear and lick it first? Oh, gosh, these are irresistible! I love poached pears and you’ve taken them up a notch or two YUM! Chocolate Poached Pears?!?! Oh dear, I feel like I’m falling in love. I’m definitely bookmarking this recipe to make in the future. Thank you for the #chocolatelove inspiration! I love poached pears and never would have thought of poaching them in hot chocolate! I am a chocoholic this recipe is for me. I had a version of chocolate poached peppers in a restaurant about a year ago and absolutely loved it! I have tried to recreate the recipe a couple of times but failed miserably. I will definitely try it your way though. Love the idea of using poached pears. My favorite pear recipe is pear crisp! It’s just so perfect! i love dry roasting pears (with fruit juice) and drizzling them with cinnamon and maple syrup. i would love chocolate sauce!!! can’t wait to see your valentine’s day happenings with M. i bet it’ll be epic. Looks yummy Nelly. I love poached pears.